What is a pickpocket? Apollo Robbins is the worlds best. Watch this funny video to find out. See if you can spot the terms in the table below. All criminals should be punished and have a salary cap from the moment they convicted of their crime, others believe they should be given a second chance and be allowed to earn whatever they can. What do you think? Give reasons and examples to support your position. Collocations: super power, surveillance system, security guard, human attention. 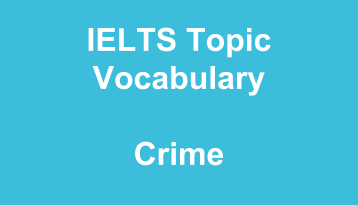 For more info on IELTS Vocabulary, click here.